Rec: 1994 to 1999, Rosslyn Hill Chapel, Hampstead, England. Johann Christian was the youngest son of Johann Sebastian Bach and his second wife Anna Magdalena. While he was a major composer of his time, he is best known today for his friendship with Mozart, who even reworked several of Johann Christian's piano sonatas as concerti. A composer of instrumental music, such as these keyboard concerti, Johann Christian Bach also wrote several opera seria. He was criticized for abandoning his father's musical style and religion (he converted to Catholicism), but his music fits in perfectly with the classical style and idiom. Nevertheless, his music can be facile and predictable. The harpsichord solo in the opening movement of his first concerto belies this lack of depth. Johann Christian was no amateur, yet his music often sounds as though it was written more as musical wallpaper than as demanding music. Totally unlike the music of his father, this composer can be seen as a sub-Mozart. The opening movement of his sixth harpsichord concerto, before the keyboard takes a solo, sounds like so many Mozart concerti or overtures, that one could easily mistake the two composers. Oddly enough, only three of these concertos are in minor keys, and they are all among the earliest works (though naturally some of the internal movements of the concerti are in minor keys). Why did Johann Christian Bach not like the minor key? Could it be that he was not suited for the type of drama and emotion this key often suggested? His F minor concerto (one of the Berlin concerti) shows that this is not the case - in fact, this concerto seems to have much more melodic invention than many of his other early works. But the middle, slow movement is dense and heavy, and perhaps he preferred the lighter sound of the major keys. The music gets better as Johann Christian develops more experience. His piano concerti are far superior to the harpsichord works, though, again, they sound like a pale copy of Mozart's works. But he knew all the tricks of the trade, using a masterful interplay between the soloist and orchestra, though, in the end, these sound more like musical pyrotechnics than melody. Anthony Halstead and the Hanover Band do their best to bring this music to life, though I remain unconvinced. 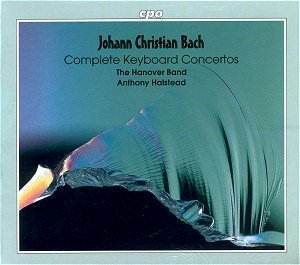 Halstead's performance in the harpsichord concerti is more than competent, and the balance between the keyboard and orchestra is ideal. His performance on the pianoforte are excellent, and the orchestra sounds more convincing in the later works, almost as if the musicians are uncomfortable with the lighter sound of the harpsichord. The tempi are often energetic, and there is a good amount of drive. But the pianoforte is often miked strangely, giving it an odd position in the soundscape, a bit too far forward. It should be noted that the violins are often very present, and the first and second violinists have roles that make them almost soloists as well. Their performances are very good, giving a very attractive sound and overall texture. While Johann Christian Bach was the most famous of Bach's sons during his lifetime, his music is neither as challenging nor as original as that of Carl Phillip Emmanuel Bach. It is often attractive, and sometimes interesting, but remains the kind of music that all sounds the same. The similarity with Mozart's music is apparent, and Johann Christian lacks the uniqueness to make any of these works unforgettable. But the recordings and performances are excellent, so if you are looking for some Mozart-like music to broaden your horizons, this would be an excellent choice.